The upshot is that there’s a large number of fine high end turntables around that most people have either completely forgotten about or never even heard of in the first place. Along with Ariston’s RD11, the JBE and the original Dunlop Systemdek, Logic’s DM101 is just such a deck. No, it isn’t the greatest device ever to spin a Long Playing record, but classic vinyl aficionados should find it well worth a look. Costing £299 in 1981, it was an expensive piece of kit. Like the Linn it was a well finished, belt driven design using the familiar Philips/Impex 24 pole AC synchronous motor, modified with a quarter inch thick steel mounting plate to reduce vibration. The 356x483x153mm plinth was a solid Medite affair finished in satin black, with a wonderfully nineteen seventies smoked Perspex dustcover. Again, ‘a la Linn’, it used a two-piece cast aluminium platter with a hardened steel spindle set into the inner platter. The 2.5kg outer platter was machined to have almost all its mass at the rim, and topped by a Michell Focus-style bonded red felt mat. The aluminium bearing housing contained two plain bronze bushes, together with a hardened steel thrust pad with a ground and lapped face, with a ball concentrically located in the end of the spindle. This is all pretty conventional stuff, but the Logic’s design had a twist. The 8mm aluminium subchassis took tonearms directly via adaptor plates, obviating the need for sound-degrading armboards. This was then suspended at three points using an ingenious double spring arrangement – both springs were attached to round steel plates at one end, and at the other to brackets mounted opposite each other on the plinth, meaning the brackets hung in the middle. This meant that if the chassis movement caused one spring to compress in one direction, the other spring would have to extend by the same amount. The result was more effective damping, and less long term drift out of adjustment. Chassis levelling was done by a simple screw adjuster. Overall then, the Logic was an extremely thoughtful design, a fact born out when you listen to one. Compared to a similar vintage Sondek, the DM101 sounds slightly lighter, faster and breezier, with a firmer bass that lacks just a bit of the LP12’s extension. Move on up the frequency range and there’s noticeably less clutter, with a clearer and more neutral lower midband that images more positively. Soundstaging is tighter with better image location – this was always a weak point of the Sondek – and there’s a touch more detail too. What the Logic doesn’t have is the bounce of its Scottish rival. More interested in neutral, even-handed information retrieval, the DM101 proves less rhythmically and musically engaging, which is probably why hi-fi journalists of the day came out in favour of the Sondek. Nevertheless, it’s still a highly pleasant listen, especially when you consider how cheap these babies are second-hand. Pay around £250 for a good one, and you’ve got yourself a front end that’s both dramatically better than Regas or Projects, and far superior to any CD player under a grand. Many Logics were partnered with SME IIIs, Mission 774s and Syrinxes, but you can easily fit a modern SME 309 or the ubiquitous Rega if you can find an adaptor plate. The result will be most enjoyable, especially when you remember how little money you’ve spent to get sound this good. I feel to many people put to much emphasis on what the hifi mags used to put out, I always prefered the Logic DM101 to a Linn LP12 and I had the Linn before i had the logic kept reading the hifi mags that said the Linn was better but every time I listened to the Logic it sounded better. Later I switched to a Roksan Xerxes and I would like to tell a little story before I bought the Xerxes I went into a well known HiFi store in London where I had a demo between a Linn LP12 with Ittok and ATOC7 and a Xerxes with Tabriz and another ATOC7. After the demo I said I preferred the Xerxes well the assistant said he when he first had a demo of a Mantra Manticor against the LP12 he prefered the Mantra but now he knows better as he has now learnt the sound of the Linn?. When I told him I still prefered the Xerxes he said to me that I should not be listening to hifi as I did not know what I was doing. I kid you not that’s what happened, well with the money in my pocket busting to get out I managed to keep in in there and ended up buying the Xerxes elsewhere. The moral of the story is that even the shop assistants were into the marketing hype and I heard from an ex-dealer that there was more money to be had selling the Linn than what they got from its competitors.so even though I loved my Linn LP12 before I got my Logic DM101 and would not buy one again. Try and get a blind demo so you can not see what turntable is playing and you will see that there is so much BS about the Linn that I now feel Linn did a dis-service to the hifi industry. It just goes to show how gullible most people are. I think there were clear differences between the LP12, the Xerxes and Manticore – and the Linn was better in some respects and less good in others. 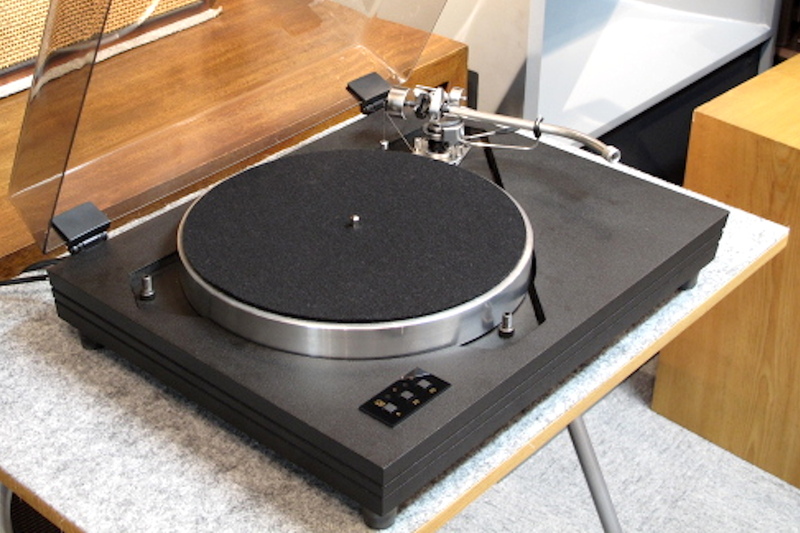 The idea that the LP12 was categorically the best in every way – propagated by the press at the time – was errant nonsense, but it was certainly a very strong performer in its own special way. I think all the hype from certain hi-fi magazines at that time has rather caused a backlash, and people are loathe to respect the LP12 because it was pushed so hard by certain journalists at a certain time. It really shouldn’t be dismissed out of hand – I am certainly still a fan, although it’s not the deck I use everyday now. I’m from South America. 1982 went to Graham Audio shop inTotetenham ct rd. I was 15. Listened to the lp12 and the dm101. The dm101 was clear winner for me and left the shop with one and shipped it home. I keep it until this day. Fast forward 20 years and I ended up living in Royal Leamington Spa where they used to manufacture it. I have a logic tempo fitted with a sme 3009 arm supper sounds had at least 35 “years brill. I had my Logic DM101 with center spring for 35 years now. Bought it used in 1983 with a new straight Linn Basik LV-X. I have two questions. 1) Wondering if anyone knows where I can buy new suspension springs and the 3 rubber grommets that are used below the three adjustment screws. 2) In my 30+ years I always find the sound to be thin and lacking in body regardless of the cartridge used. Does anyone have an idea what may be the problem? Edward the logic is a very neutral turntable still the later models with the centre spring helped a little then they did the electronic version which had a better inbuilt power supply but logic also damped the center section the part where the arm fits onto this better dampens the unit the sound is less thin and has greater body and weight to the music. I think this is the best update but sadly is only on the electronic version. You could dampen this yourself by fitting bitumen pads on the underside. This section of the turntable was aluminium/steel so this needed damping a pity Logic did not do this on the earlier versions. At one time or another I have had all 3 versions the earliest without the center string, then came the center spring version then the last and best by far had the center spring the improved power supply and the damped center section. Even the last version can be improved by adding further damping to the underneath. Its also important that the springs in the grommets are not twisted.. Thank you Mario for the suggestions. The rubber grommets in my unit have deteriorated but I cannot find any replacements. Any idea what alternatives I can use? Edward I know you can buy spring kits have a look on eBay or if you could find a manufacturer, I did have a few original spares but they are all gone now. The rubber grommets again it may be an idea to seek out another dm101 look at the height of the adjusting threaded bolts if they protrude above the subchasis about 15-20mm then you should be ok. The adjusting bolts than look low on the turntable shows the springs have worn down over time. It’s a shame Logic went out of business mainly due to the properganda than Linn did, any turntable that threatened their dominance was slated to get then out of the way well just my opinion then they wonder why there is such a backlash. Hi Mario, thanks for the suggestion on grommets.